Comment	 RCW74 appears as a small irregularly shaped HII nebula located in the southern constellation Centaurus, immersed in a rich star field of the Milky Way. It is partly obscured by the outer regions of the Coal Sack Nebula. The area has two large open clusters known as Danks 1 and 2, containing both hot and massive stars of spectral class O and B, together with the Wolf-Rayet star WR 48a. 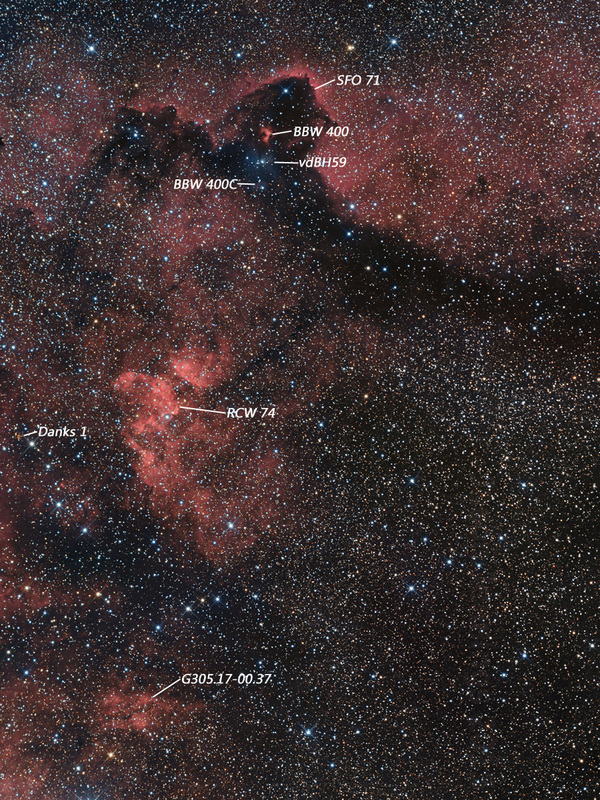 The area is believed to be one of the most massive star forming regions known in the Milky Way. Text adapted from wikipedia. Image is a Ha+R[GB] composite.